When farmers and produce workers have to wear masks to apply pesticides to herbs, fruits, and vegetables you know there is something wrong with the picture. Pesticides are not only toxic for the soil, the plants, and the bees. There are poisonous to us! 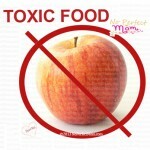 The pesticides remain on the fruit, herbs, and vegetables after harvesting and even after you wash them. Our gut flora is especially vulnerable to these toxic pesticide residues. We try to eat as much organic produce as much as we can. Sometimes prices can be a bit outrageous. But hey! is better for our health. However, if we have to choose between conventionally grown and organic, the produce listed below is so saturated with pesticides we definitely buy it only organic. The following 14 produce contain the most pesticide residues of most all vegetables and fruits available in US market. According to EWG’s Shopper’s Guide to Pesticides™, avoid these to reduce your exposure to toxic chemicals. * Source: The dirty dozen by EWG.